Did The White House Miss Something on Climate Change? On Monday, the Obama Administration released a 332-page report on the threat from climate change. While this conveys a sense of urgency, it would be appreciated if — with the same urgency — our policymakers could actually address the fact that the livestock industry is responsible for more human-caused greenhouse gas emissions than the entire transportation sector combined. The good news is that we don’t have to wait for policymakers to take personal responsibility and change our food choices. What we decide to eat has immense environmental, health, and ethical implications, and is one of the most impactful actions we can take as individuals. Please go vegan to help the environment, as well as to withdraw your support for the needless killing of billions of animals each year. 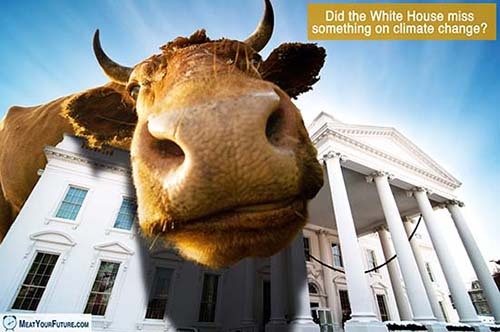 World Watch Report (finding livestock is responsible for at least 51% of total human-caused GHG emissions).